In China, guests expect more than just a comfortable bed and free Wi-Fi. “Everything must relate to luxury,” explains Karen Kim, senior director of interior design for Marriott International in Asia. She oversees the aesthetics of 45 different hotels across China with 15 more currently in development, and a total of 120 projected over the next several years. It is her responsibility to make sure each new property added under the Marriott aegis—including JW Marriott, Marriott, Renaissance, Courtyard by Marriott and Marriott Executive Apartments brands—conveys the company’s message to its local Chinese patrons and international travelers alike: that the Marriott name assures them an extraordinary experience. 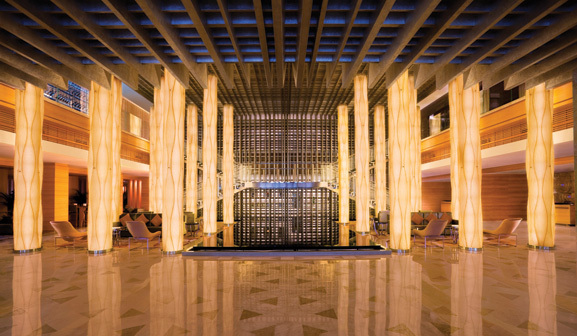 To make sure that Marriott hotels in China all have that celebratory atmosphere, Kim and her team work with internationally known architects and interior design firms to ensure that each property has a unique look and identity, while still maintaining the cohesive “Marriott look” that reflects each brand’s positioning. The JW Marriott Hotel Hong Kong. Courtesy of Marriott. While the design and architecture may be international, the materials used are specifically Chinese. “China produces a lot of wonderful raw materials for designers to work with,” says Kim. “Natural materials like onyx have their own character and individuality, and when lit from behind, onyx becomes a jewel box.